Leading residential developer Anwyl Homes has helped the rising stars at a local football team with new sweatshirts to keep them warm before and after matches and also while training. Currently developing at a number of locations across Cheshire, including Abbeyfields in Sandbach, Somerford Grove in Congleton and Heathfields in Audlem, Anwyl has helped the Under 13s squad at Willaston White Star by providing 16 bright blue sweatshirts for the team, with each one featuring the Anwyl logo and players initials on the front. Willaston White Star is a thriving football club and a key part of the local community. The under 13s side has been playing together since U7 and has recently been crowned league champions of the Mid Cheshire League Division 1. They also recently won the League Cup beating Woodford in the final to complete the season double. Coaching is done on a voluntary basis and the club relies on sponsorship and fundraising by parents to ensure the boys have everything they need for their weekly training sessions and regular competitive matches. 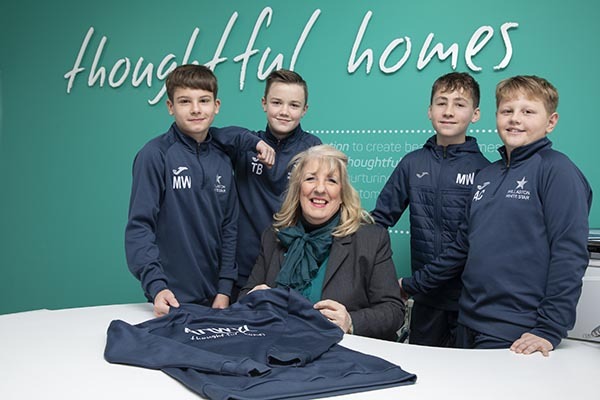 Players from Willaston White Star came to Anwyl’s Abbeyfields development in Sandbach to collect the new sweatshirts from Homes Advisor Julie Young. Located on Middlewich Road, Abbeyfields is a stunning development of high quality four and five bedroom new build homes that has proved popular with families looking for a quality new build home that is close to the thriving and highly desirable Cheshire village of Sandbach. For further information on the properties available at Abbeyfields, please visit the sales centre (open Thursday to Monday, 11am until 5pm), call one of the team on 01270 750220 or visit the website www.anwylhomes.co.uk.